19 Dead, Nearly 50 Missing In Laos Dam Collapse A dam that is part of the unfinished Xepian-Xe Nam Noy hydropower project — being built with the help of a South Korea company — collapsed on Monday, sending a wall of water downstream. 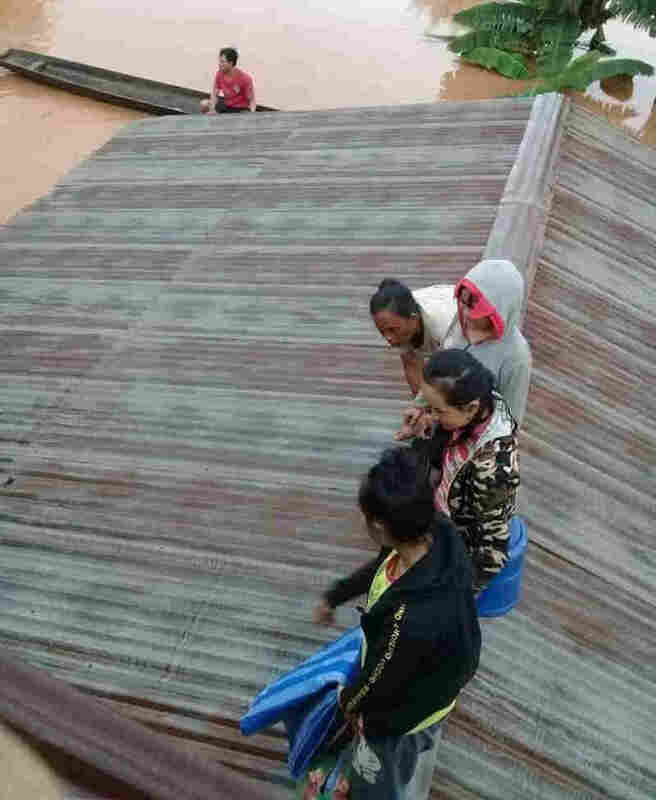 Villagers take refuge on a rooftop above floodwaters from a collapsed dam in southeastern Laos on Tuesday after a newly built hydroelectric dam was breached in southeastern Laos. Helicopters and boats have been deployed for survivors, district governor Bounhome Phommasane told the state-run Vientiane Times. The newspaper, citing unofficial reports from the provincial government, said about 19 people had been found dead and 49 were believed to still be missing. With moderate to heavy rain in the forecast, the governor says the flood level is expected to rise, adding to the several villages affected by the initial dam break. Provincial officials were quoted in the Times as saying seven villages had been affected. The official Lao News Agency (KPL) acknowledged, "the disaster has claimed several human lives, left hundreds missing and more than 1,300 families (6.600 people) homeless." However, a government official speaking to Reuters from the capital, Vientiane, who asked not to be named, said: "Dozens are dead. It could be higher." "We will continue with rescue efforts today but it's very difficult, the conditions are very difficult," the official said. Landlocked Laos is one of Southeast Asia's poorest and most isolated countries, governed by one of the world's few remaining communist governments. In recent years the country has sought to become "the battery of Southeast Asia" by exploiting its extensive river system to generate and sell hydroelectric power to its neighbors. The South Korean partners in the Xepian-Xe Nam Noy dam project said it discovered that the upper part of the structure had been washed away 24 hours before the collapse, according to AFP via The Bangkok Post. "SK Engineering & Construction, a South Korean builder that is one of the partners in the project, said it discovered the damage to an auxiliary dam at around 9.00pm Sunday local time. 'We immediately alerted the authorities and began evacuating (nearby) villagers downstream,' it said in a statement." SK Engineering says it warned the government about further damage to the dam around noon, a few hours before the collapse. KPL reports that the $1.2 billion, 410-megawatt dam project is "the first build-operate-transfer (BOT) project to be undertaken by South Korean companies in Laos." It was scheduled to begin operation next year.